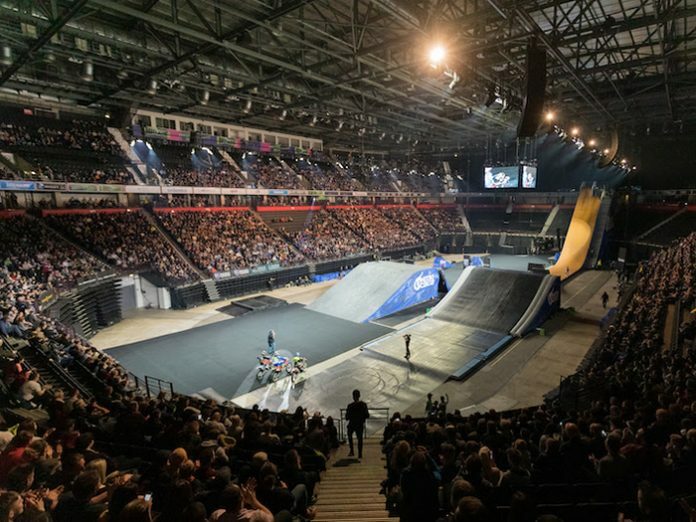 The world-renowned Nitro Circus features Travis Pastrana and his friends travelling around the world riding dirt bikes, base jumping and performing stunts – and this has led the event onto several TV series, a 3D feature film and major arena tours. GLP’s automated heads have featured on this production since the days when veteran Australian LD Francesco Calvi was specifying their fixtures. Current LD Nico Riot is another strong advocate of GLP. Incredibly he joined the tour in September 2018, at the same time as Matt Doherty – whom he served with on the Marilyn Manson tour – was about to join Nitro Circus for the US run. And the fact that the 40-strong troupe was seeking a new LD at the same time sounded the cue for Nico’s arrival. His main challenge was that he needed to light the show for different perspectives simultaneously – the audience’s, the athletes’ and the cameras. “360 vision for everyone,” as he put it. “I try to avoid casting any shadows on the tracks for the athletes, and the same for the cameras. Plus the audience needs to see everything without being blinded.” And with massive ramps, trying to light everything from bottom to top and each side was a near impossibility. Even by deploying 40 movers and 20 strobes pointing at the tracks, there was insufficient lighting for the cameras. Thus when production freed up extra budget for additional fixtures, specifically for the Facebook broadcast event, he immediately turned to GLP’s JDC1, knowing how effectively they would read to camera for the transmission. For the earlier design, when budget permitted, he had deployed full X4 Bar 20 floor FX, set between the tracks and kickers, with Neg Earth taking care of the European lighting supply and Delicate Productions the vendors in the States.